Hills Prescription Diet ID Digestive Care Dry Food for Adult Cats has been specially developed for the nutritional management of cats with gastrointestinal disorders. 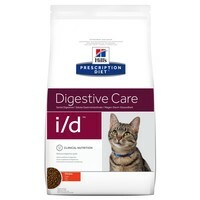 Formulated to provide the digestive care that your cat needs, Hills I/D is a highly digestible recipe with an optimal balance of soluble and insoluble natural fibres that help improve digestion, and promote the growth of beneficial bacteria. I have two cats, one with pancreatitis. This lets her eat dried food at the same time as the other cat. As small meals are preferable with gastro-intestinal disorders this is a helpful product as I can put a small amount out. If the other cat eats this it is not a problem. It helps though if you've two kinds of dried cat food (two cats or more) be sure to buy one with a different shape to this biscuit. I have a British Shorthair who has had problems with vommiting his food after eating,for years. Recently he suffered continuous diarrhea with blood and mucus. After lots of tests, medication and a very hefty vets bill, I switched his food to this one. Instant result! Very impressed with the outcome of this diet. used regularly at the rescue shelter for many dogs and cats with diarrhoea, excess vomiting and gastro intestinal problems and is an excellent diet. i have a fussy cat at home who had a very irritable digestive system with previous diets that i have tried. blood and mucus was present in the faeces and as i am familiar with the success of i/d i purchased it from VetUk. delivered the next day and my cat had normal faeces and healthy digestion within 3 days. very poorly cat one day and back to his normal, healthy, active self in 4 days after my order was sent and he has never showed such an interest in any food he loves it so much! excellent diet and highly recommended! this food is loved by all of my cats.The delivery service is second to none.